From North America, Europe and Asia. This tree is valued for the spectacular show of blossoms in spring. There are masses of single, semidouble, or double flowers in white, pink, or red. Small red, orange, or yellow apples, ranging from 3/4" to 2" wide ripen from midsummer to autumn. White, pink, or red in spring. 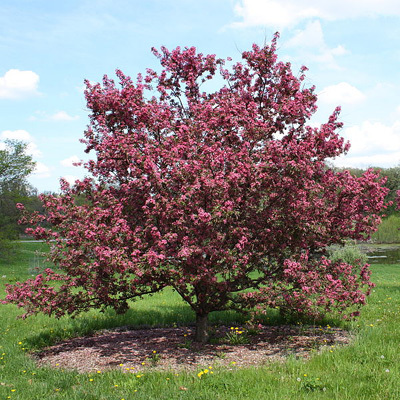 Good ornamental tree with lavish spring blooms. Fruit can be used for jelly and birds enjoy them as well.